Why am I living in Malaysia? I guess I should start of by explaining how I’ve found myself living in Malaysia. I work at Heriot-Watt University in Edinburgh and the University has two international campuses in Dubai and Malaysia. A lot of our students transfer between campuses during their studies as part of the uni’s ‘Go Global’ programme. 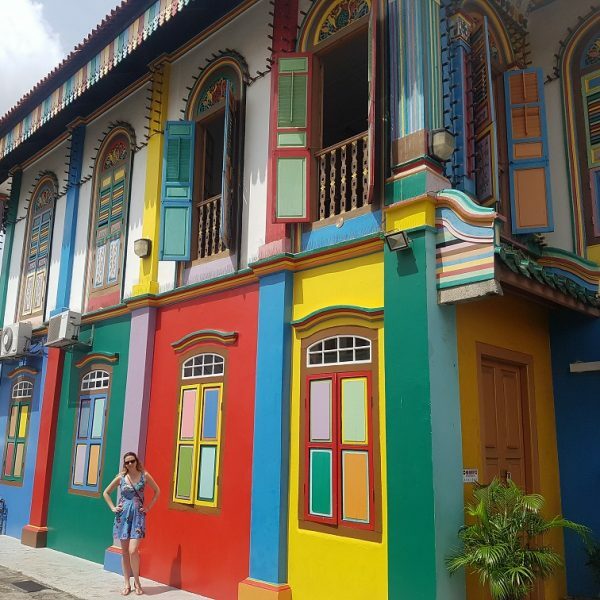 I worked on the marketing campaign for Go Global and the more I spoke to, and read blog posts of, our students who took part in a transfer the more green with envy I became! A year or so later, I spoke to my manager about the possibility of me doing a staff transfer. To my delight, she was so supportive (thank you, Rebecca!) and helped to keep me sane during the long and stressful months of planning and visa applications, including a last minute dash down to London to visit the Malaysian embassy! 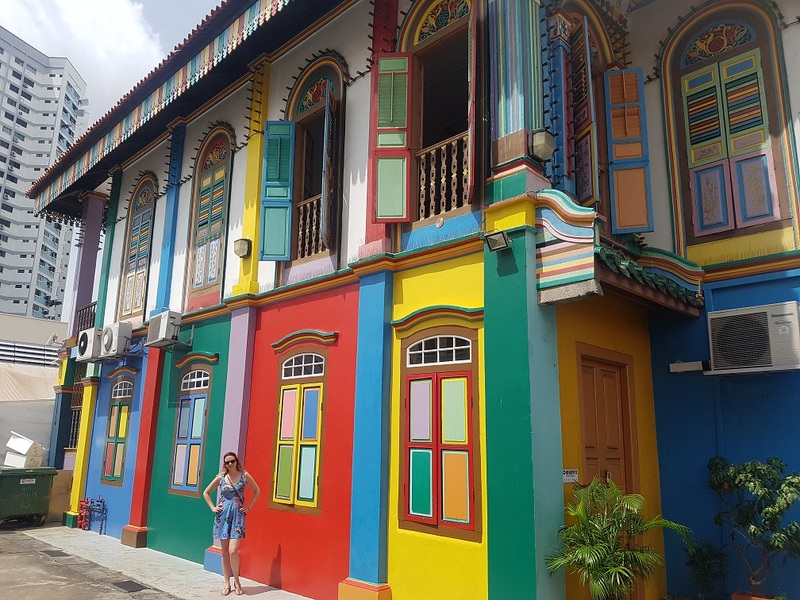 As luck would have it, during the time of me being green with envy, my husband David started a course at Heriot-Watt which allowed him to take a semester or year in Malaysia (his course isn’t available in Dubai) as part of his studies. 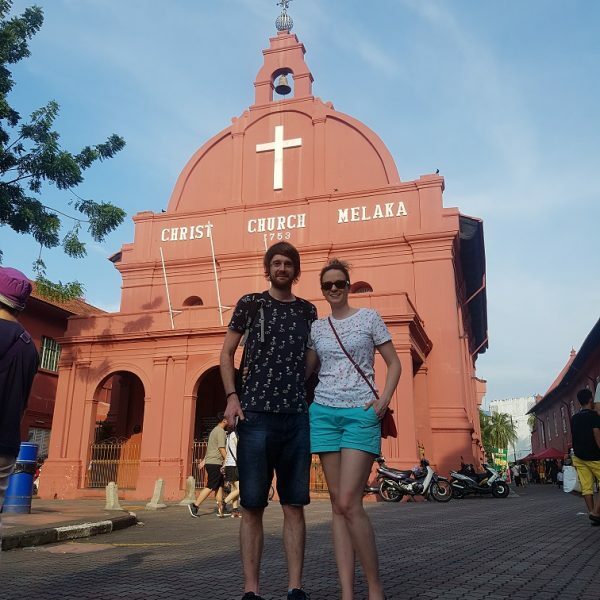 The initial plan was for us both to spend a semester (Jan-May 2018) in Malaysia but the visa issues were followed by tax issues and I could only stay 59 days without being taxed in both countries. 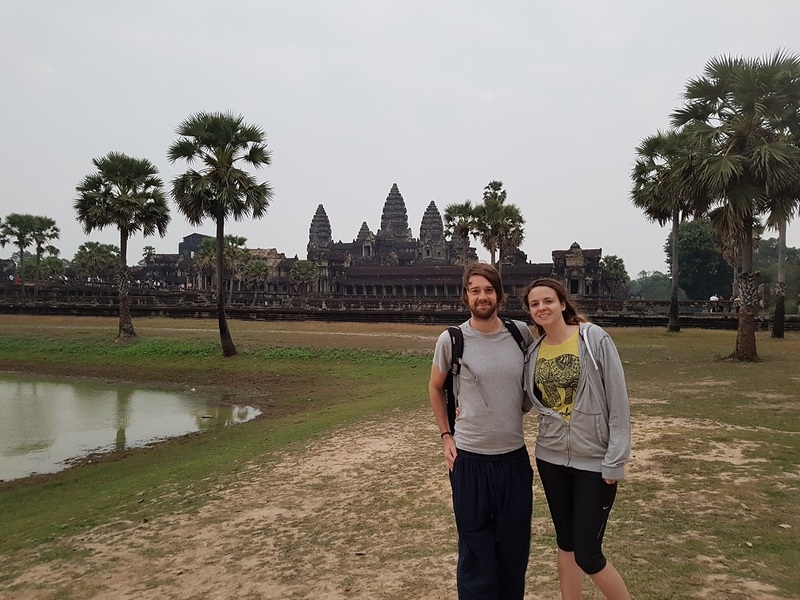 Deciding that two months in Malaysia was better than no months in Malaysia, we pushed on with me planning to leave at the start of March and David staying on until his exams in May. I’m well over half way through my time in Malaysia and quite gutted that I’m not able to stay the full semester with David. I feel like I’m really starting to get into the swing of things here, making some good buddies (shout out to Nurul!) and getting stuck into projects with the team here at work, and then need to leave. I shall be green with envy when I’m back in Scotland and David’s still walking about in his shorts in 30 degree heat! 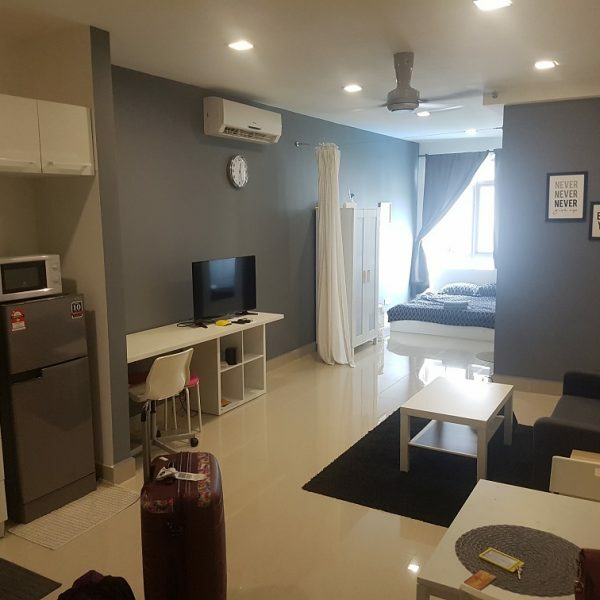 Where am I living in Malaysia? 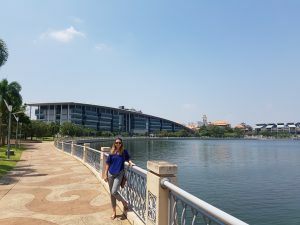 Heriot-Watt’s Malaysia Campus is based in Putrajaya, which is about a 40 minute drive into Kuala Lumpur. The campus itself is in a fab location, based on a big (man-made) lake and I’ve managed to get myself a desk with a great lake view! 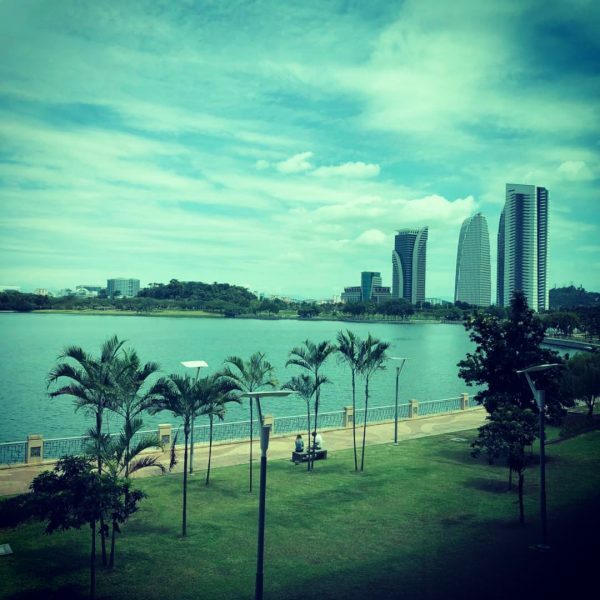 Putrajaya is a planned garden city and less than 20 years ago it was mainly marshland. 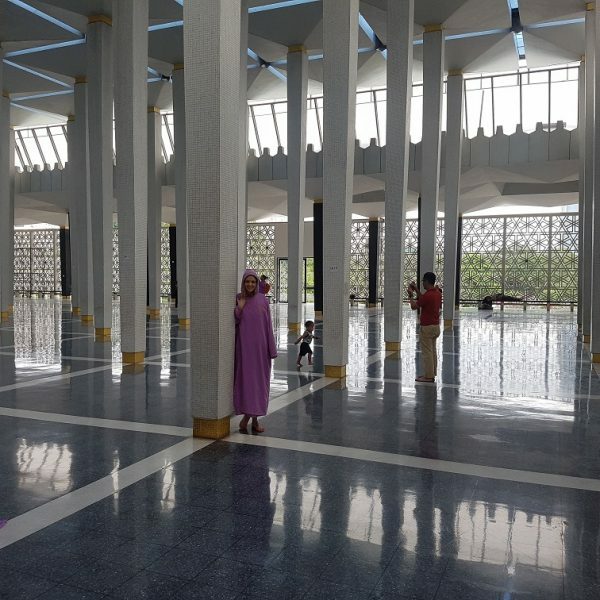 The government was moved from Kuala Lumpur to Putrajaya due to KL’s overcrowding and congestion. In contrast, Putrajaya is so quiet with hardly any traffic. 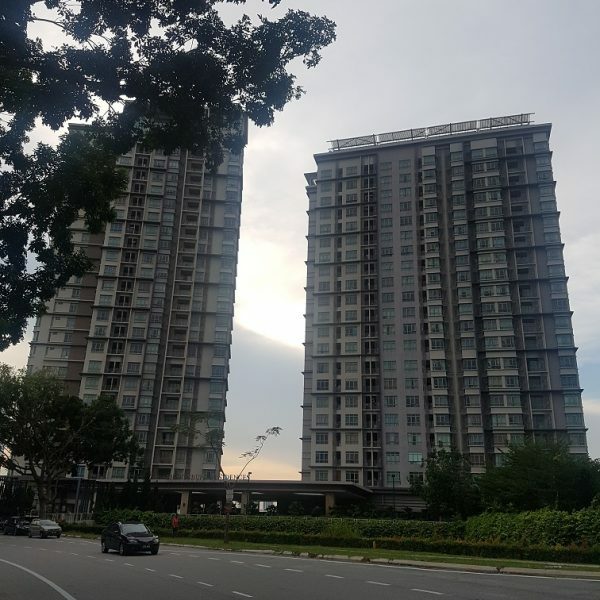 We briefly considered getting accommodation in KL but decided to stay in Cyberjaya instead – why have a 40+ minute commute when you can have a 10 minute commute? Cyberjaya is another strangely quiet place where people come to work in tech companies then leave at 5pm. 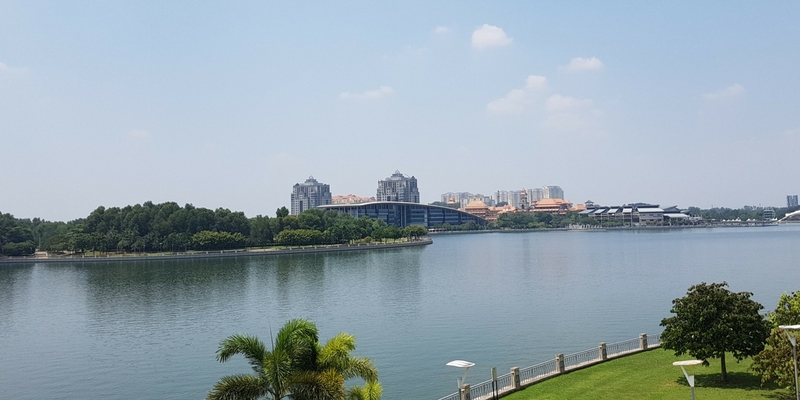 Though they don’t have much character, Putrajaya and Cyberjaya are both good places to work and live. I feel that they are much safer and more chilled than KL and I’m glad we decided against staying in the big city. The most obvious difference between Malaysia and the UK is the weather – especially when I’ve spent two of Scotland’s most ‘driech’ months here (I timed that well!). The temperature is consistently around 30 degrees. At one point it dropped to around 25 degrees and – I kid you not – people were complaining about the cold winter! Apparently slightly unusual for the time of year, it rained a LOT when we first arrived. And when it rains, it REALLY rains! I was in an Uber in January and the rain outside was crazy heavy – like stand outside for 30 seconds and you’d be drenched heavy – and my driver said ‘this is nothing – usually when it rains you can’t see the car in front!’. Rain makes the traffic around Kuala Lumpur a nightmare. If it’s raining, everyone in the office runs out the door at 5pm knowing that the drive home will be twice as long. But the 30 degree heat remains so at least the puddles are warm! We seem to have luck on our side with the weather – it rained while I was working and stayed dry for weekends and days off. The rainy season seems to have ended now, though it’s often overcast instead of bright blue skies. When the sun does pop out to say hello, you’ll find all the Malaysians hiding in the air conditioned buildings finding it odd that David and I want to sit outside to have lunch! It’s funny that people in the West always want to get a good suntan, use fake tan and sunbeds and people in the East avoid the sun and want to be pale. It’s hard to buy a face wash here without it claiming to ‘whiten’ your skin or a suntan lotion with SPF below 50. 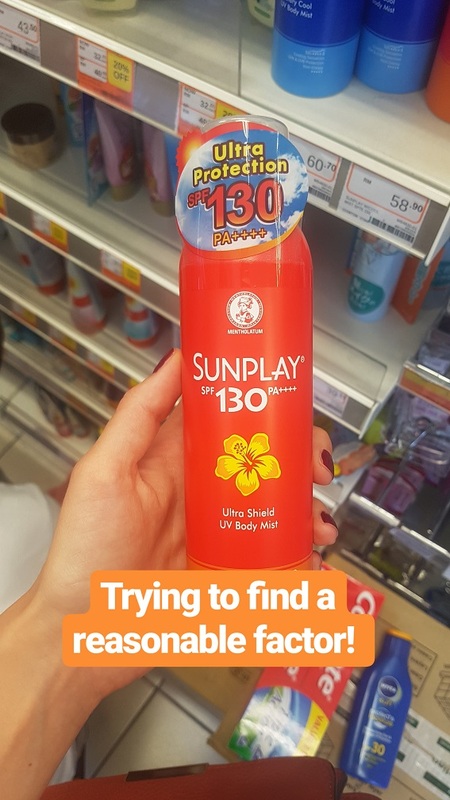 I saw SPF 130 in a shop! Aside from the weather, the most striking difference between the UK and Malaysia is the constant presence of religion. Islam is the country’s official religion but people can freely practice other religions and there are also a lot of Hindus and Buddhists. Of course this isn’t the case for everyone but I feel that religion doesn’t play a big part in the everyday life of most people in the UK. 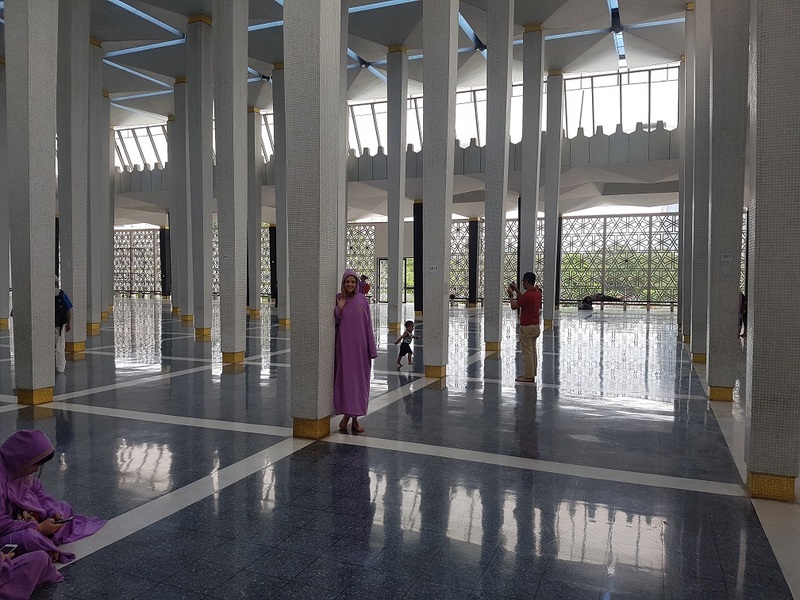 In Malaysia, religion runs through nearly every part of life. 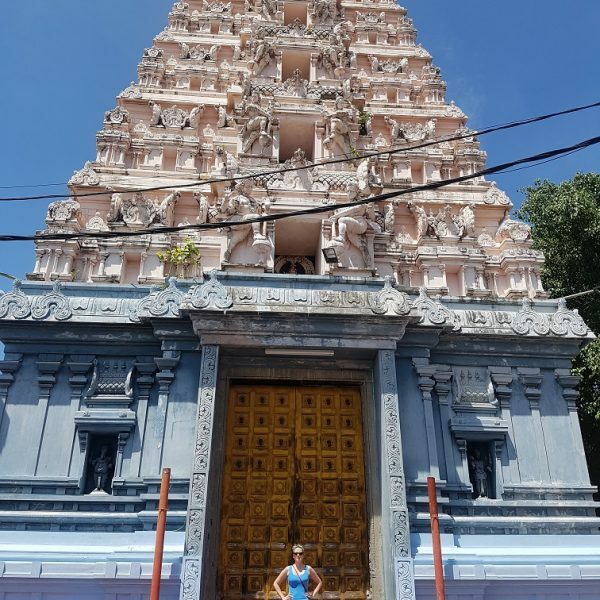 I’ve loved learning more about the various religions from my friends here and visiting various mosques and temples. And there is a lot to learn and be aware of when you live in or visit a Muslim country – for example David made a blunder in one of his first classes when he went to shake a Muslim girl’s hand – no touchy! Probably my favourite thing about Malaysia is that it is such a melting pot of cultures. Beside religion, this also plays a big part on languages spoken. As with many other countries I have visited, I once again find myself being slightly ashamed that I’m the only person in the room who can speak a mere one language! (I blame our schooling system in the UK and, in my defence, I have tried to learn German, Italian, Japanese and Chinese over the years!) The official language is Malay and I have yet to find a Malaysian who doesn’t speak English. There’s also various dialects of Chinese and Indian languages widely spoken. Just to confuse things for me, it’s not unusual for people to mix a bit of English and Malay in a sentence! To explain the title of this blog post, Malaysians use ‘lah’ a lot in sentences. I don’t think it actually lah means anything or understand its use lah! All these religions and cultures plays a massive part on food in Malaysia. 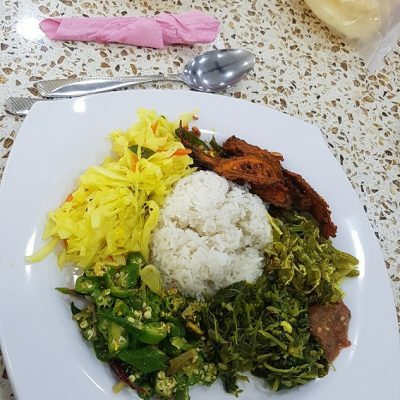 Firstly, most places are halal and it’s very rare to see pork (not eaten by Muslims) or beef (not eaten by Hindus) on a menu so it is all chicken, chicken, chicken…and some fish. 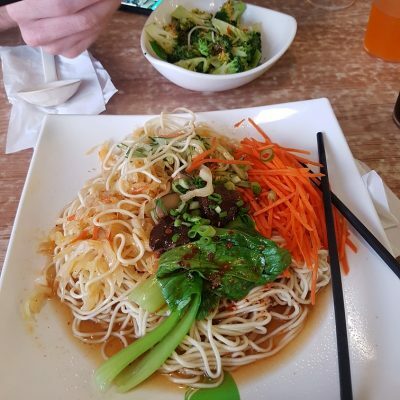 As a vegetarian, it has been quite challenging as I don’t eat chicken and try to avoid fish (sometimes I cave for sushi). In the UK, there’s always a few vegetarian options on a menu (the trusty vege burger!) but this isn’t the case in Malaysia and I’ve been told by quite a few places they have nothing on their menu which is vegetarian. 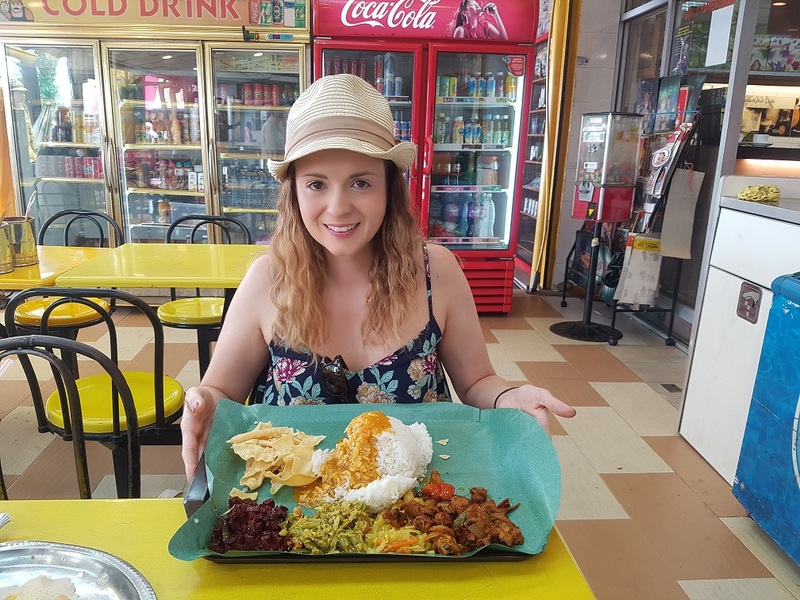 The best places that we found to eat are Indian restaurants as many Hindus are vegetarians so they always have something we can eat. 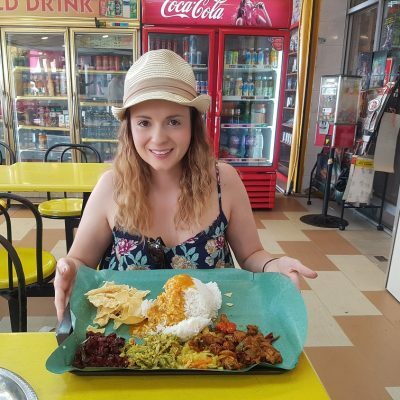 One of my favourite things here are the banana leaf restaurants where you get rice, a selection of curries and popadoms served on a big banana leaf. Usually cheap and tasty so a great go-to for veges in Malaysia. 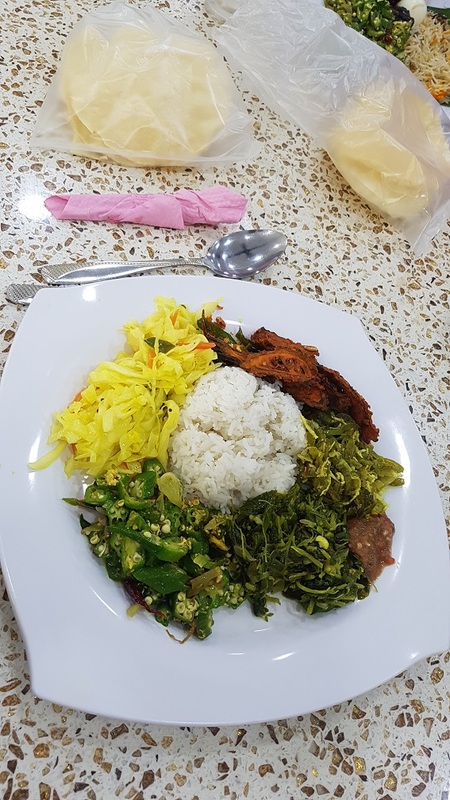 Rice is the basis of most meals, and there’s a lot of cheap restaurants which you go to (including the cafeteria at uni) where you get white rice and then add things like curries and stir fried veg. Breakfast is often rice or noodles based – though there’s only so much rice I can eat so we invested in a toaster for the apartment! Aside from toast for breakfast, we eat out the majority of the time and have only cooked in our apartment four times since we arrived. In Scotland, we rarely eat out and I even bring lunch from home to work. 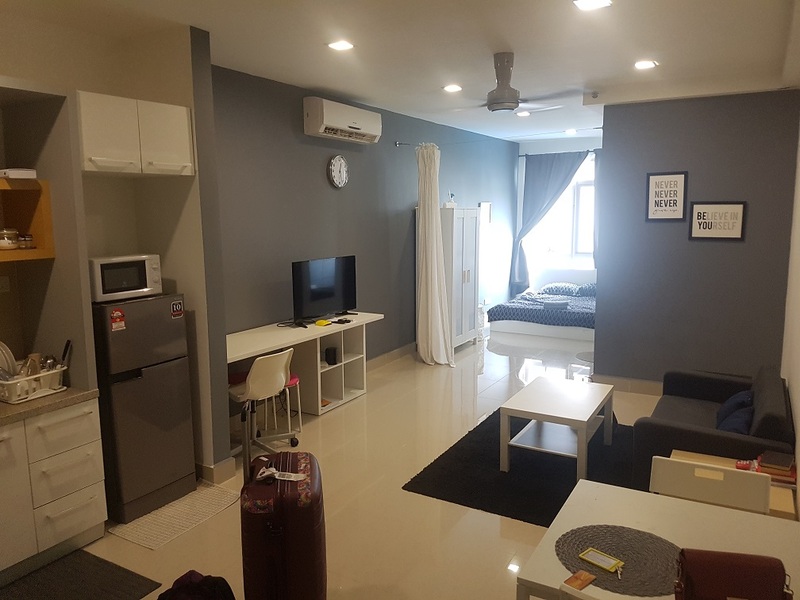 Eating out is much cheaper in Malaysia and can actually work out cheaper than making food at home (plus our kitchen facilities are two hobs and a microwave). Every time we go to the supermarket to buy food to make, it works out more expensive than grabbing a cheap meal out. 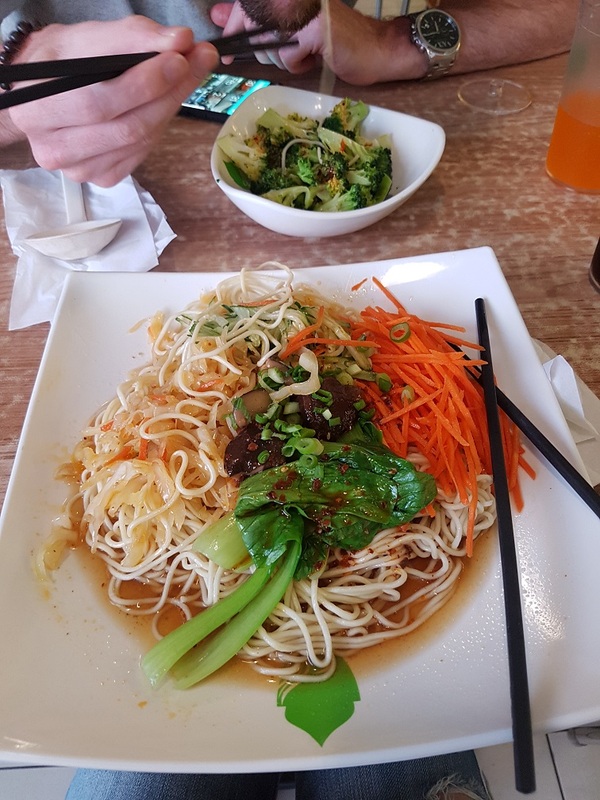 Our apartment is a few minutes’ walk from Shaftsbury Square which has about 20 restaurants to choose from – about five of which have vegetarian options. There’s a few big malls about 10 minutes’ drive away which have more choices. Bars are pretty uncommon in Malaysia as it is a Muslim country. I’m not sure if David would have agreed to moving here if he knew about the lack of pubs but he’s adapted like a trooper and buys beer from the supermarket or 7-Eleven to drink in the apartment or slyly by the pool. Although Shaftsbury Square has 20+ places to eat, not one of the restaurants sells alcohol. Our nearest bar is about a 10 minute walk and only sells beer/cider. Also, although most things here are much cheaper than in the UK, alcohol prices are about the same due to the Sin Tax (!) that is added. Uber has been my most used app since arriving in Malaysia. Uber and Grab cars are plentiful and it’s unusual that I have to wait more than a few minutes for one to arrive. An Uber from Cyberjaya to Putrajaya takes about 10 minutes (because there’s no traffic!) and costs less than a bus fare in Edinburgh. 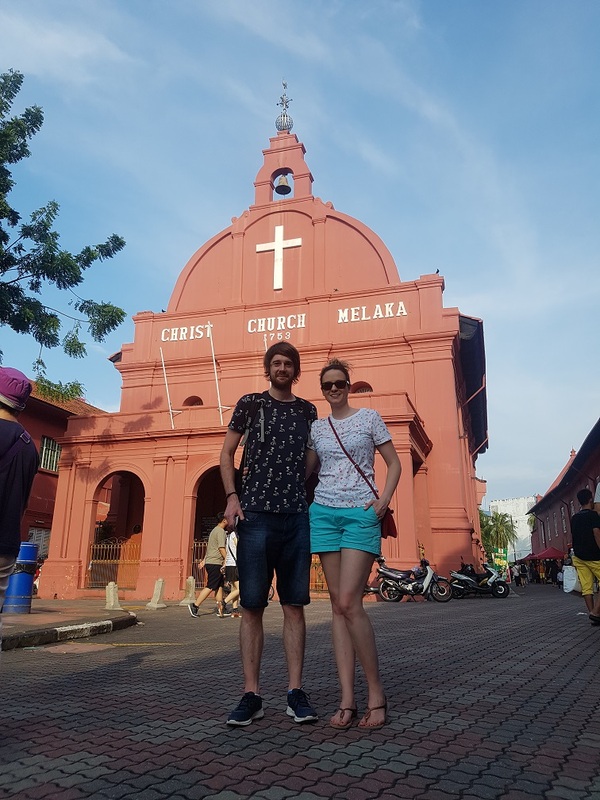 We’ve tried public transport to get into KL a few times but it doesn’t cost much less than an Uber (if there’s at least two of you travelling) and takes about three times as long. 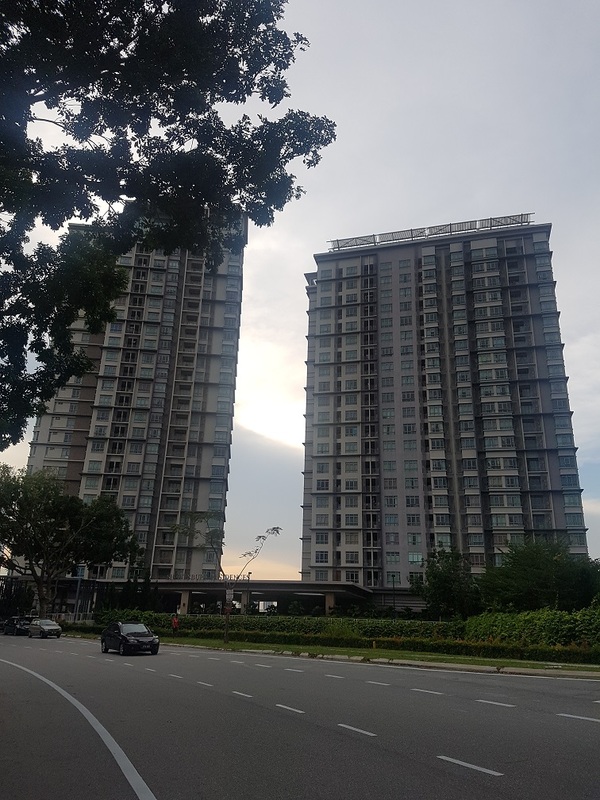 An Uber from Cyberjaya to KL takes about 30-40 minutes (depending on traffic – there’s lots of traffic in KL, especially if it rains) and costs less than £10. A few Uber drivers have been really friendly but the majority don’t say anything which I find a bit odd though it might be because they feel shy around ‘Mat Saleh’ (white person). On the subject of driving…Malaysians drive everywhere and really don’t like to walk!! My colleagues often drive somewhere for lunch which is really close to the campus – by the time they wait for the lift (no stairs either!) to the car park, find their car, drive there and eventually find a parking space, they could have walked there. When I questioned why they didn’t walk they thought it was a crazy idea! I eventually got my work buddy to walk there last week and it took 10 minutes each way. When we got back to the office people were absolutely flabbergasted that we had walked!! I haven’t dared to tell them that sometimes in Edinburgh Campus, we’ll go out for a walk at lunchtime (just for fun!) and then just have a quick lunch at our desks… Some anti-walking excuses I have heard include fear of rain starting when they’re out and avoiding the heat. To be fair, when David and I went for a lunchtime a walk a few days later and it was scorching sunshine and 32 degrees heat, I was slightly more understanding about the reluctance to walk! A perk of working in Malaysia is the number of public holidays that you get. In Edinburgh, we get a couple of days for Easter, Christmas and New Year. Because of all the religions in Malaysia, there’s lots of holidays – such as Thaipusam on 31st January, plus various other public holidays – such as Federal Day on 1st February and Chinese New Year on 16th February. 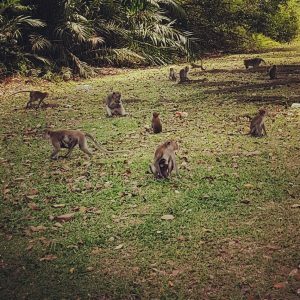 Sometimes you forget that you’re living in a tropical country, near the jungle and then sometimes you get back your apartment and find a pack of wild monkeys across the road! This has only happened once but has made me realise that they can’t be living far away! Monkeys are fun though I keep my distance due to my lack of rabies vaccine and the fact that they’re mischievous thieves. Not so fun – mosquitos. Luckily, day-to-day, I don’t see many mosquitos, as the little…insects love me and I get massive, horrible bites. The only thing I’ve found to work is repellent with DEET, which we brought with us from the UK. When we ran out, we couldn’t find any in Malaysia – every one we found was proudly declaring to be DEET-less. Luckily one of my colleagues was just about to return from a trip to Edinburgh so picked some up for us. So if you want DEET, bring enough with you! 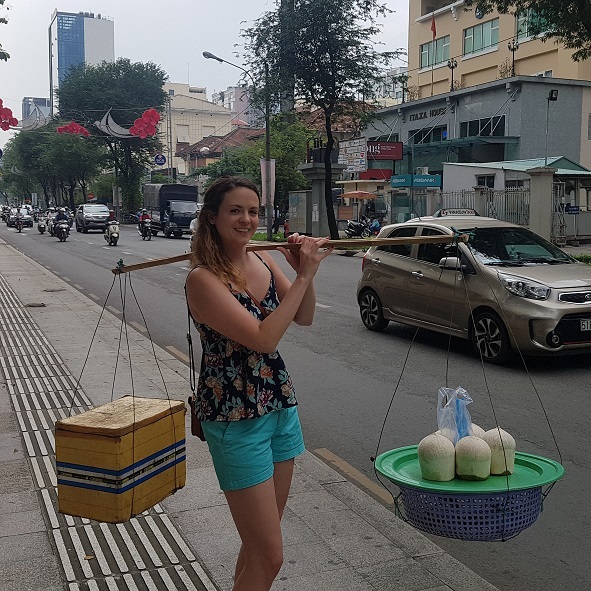 I don’t know if that’s the correct use of lah, but as you can probably tell, I’m loving life here in Malaysia and I’m going to be quite sad when the experience is over. 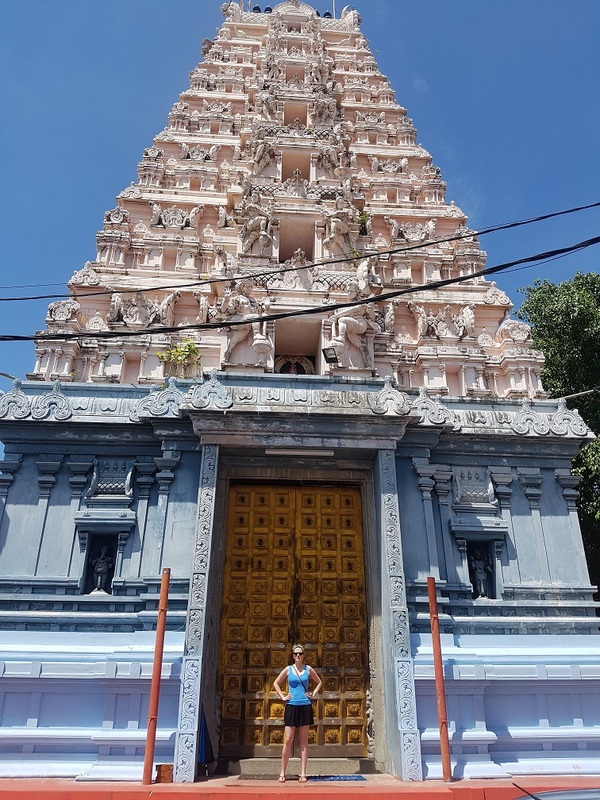 Malaysia is different enough from the UK to be constantly interesting and to allow me to learn lots of new things, but ‘western’ enough that I’m not in a constant state of culture shock. I’d say the perfect balance when moving to the other side of the world! Though it’s only been a short ex pat experience, I feel that any period of time away from the norm and outside of your comfort zone is a good thing. It broadens your horizons and allows you to learn about yourself. In only two months, I’ve met so many new people, visited new places, learnt about new cultures and have new aspirations for my career. 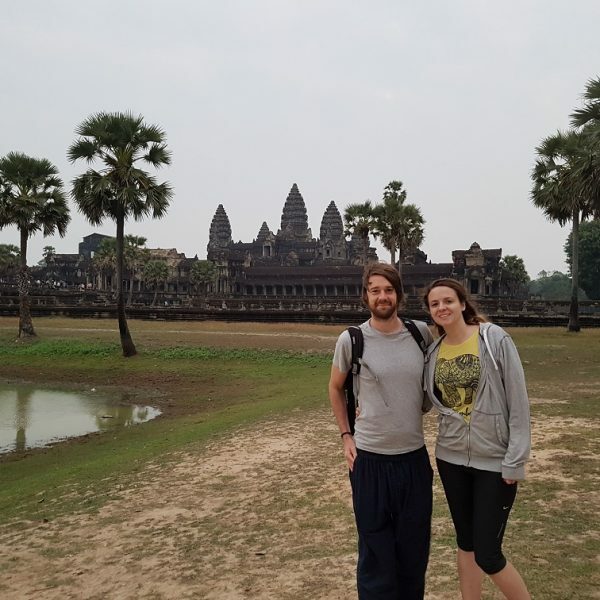 I’m so glad I persevered with all the visa and tax issues – it has been so worth all the stress!